Renewal by Andersen® offers Estate™ Collection hardware. This provides you with distinct metal finishes that add style and functionality to your windows. Your windows don’t have to look drab and purely functional. You can bring out their best by choosing from eight unique finishes from this collection. We forge our Estate hardware using solid brass, compared to others that resort to simply stamping them. Our approach ensures that the product lasts longer and doesn’t wear out as easily. The finishes are available for all styles of windows. Choose the one that suits your taste and the overall design of your interior and exterior. We also apply a “living” finish on the hardware that brings out its natural beauty over time. Renewal by Andersen’s energy efficient windows and other similar products are built with the highest quality in mind. Our windows come with Fibrex® frames, sashes and other first-rate materials. Our windows last longer than most because of the proprietary Fibrex difference. This material combines wood grains and polymers for better insulation, durability and strength. You get more for every dollar you spend because you won’t need as many repairs or replacements, or perform as much maintenance. We also provide first-rate customer service and warranties because we care about our customers. 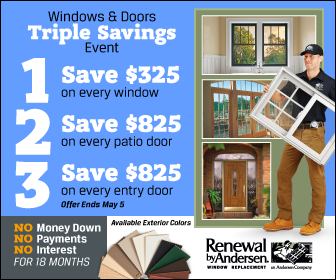 Renewal by Andersen is a leading window company that offers customizable products, from windows to doors. The company’s Estate Collection enhances the beauty of a room and adds to its overall design. The finishes come in different looks that match the look you want. The customizability of the products we offer guarantees you have control over their appearance and how they blend with your home’s aesthetics. Trust Renewal by Andersen of St. Louis for windows installation and other services. For more details about our doors, windows, products and services, you can reach us at (314) 332-2364. We serve the St. Charles, MO, neighborhood and surrounding Missouri areas.